eKYC is an online/paperless Aadhaar card based process for fulfilling KYC requirements to start investing in Mutual Funds without submission of any documents. SEBI has recently allowed Aadhaar based KYC to be used for MF investments, for the convenience of investors. The first step in starting your investment in mutual fund is KYC compliance. KYC verification enables you to open new accounts with all SEBI registered intermediaries such as the Mutual Funds, Stock Brokers, Portfolio Managers, Depository Participants, Venture Capital Funds and Collective Investment Schemes eliminating the need to repeat standard KYC. The normal KYC process requires submission of KYC form along with investor signature and additional documents for ID and address proof. In-person verification (IPV) and sighting the original documents needs to be completed by a competent person. eKYC completely eliminates paperwork and IPV to complete the KYC process. You must have below information for getting started. The OTP verification based eKYC is a simple, hassle free 3 step process. As per SEBI guidance, investors who complete KYC using Aadhaar based eKYC using One Time Password (OTP) based verification method can only invest up to Rs 50,000/- per financial year, per mutual fund house/ Assets Management Company (AMC). This facility is applicable for Resident Individuals of Indian Nationality only. What are the benefits of this facility? Go toSBI MF online page and select e-KYC from the top corner OR go to direct link eKYC. For completing eKYC, all mutual fund houses uses CAMS (Computer Management Services Pvt. Ltd.) services. So investors will be redirected to CAMS Online site for the e-KYC process. Click on “I Accept” button to continue. On the CAMS Online site, you will get the below-mentioned screen, where OTP option will be pre-selected. Enter your Aadhaar number here & Click on “Generate OTP” link, your Aadhaar number will be validated against the Unique Identification Authority of India (“UIDAI”) database via OTP. UIDAI sends the OTP to the mobile number registered in their records. Enter received OTP in the shown box. You can also notice there is another field named “Do you want to invest or redeem through paper-based Request?” click on “NO” radio button here. Give your Consent And Declaration by clicking on check box as shown in the image and Click on “Next” button. Your Aadhaar number will be validated, and all the details that you have given for your Aadhaar card will be populated on screen as shown in below image. Verify that all details are correct. If not, you have to get that corrected from UIDAI first and then re-apply for e-KYC. Enter “Place“ at the bottom and click on “Generate PDF“, this step will create your KYC application in PDF format. You need to check the PDF file for all the information. Once that is verified, click on checkbox shown at the bottom “I have verified KYC application pdf“. Please send OTP for e-signing the pdf. You will get another OTP for e-signing the pdf file on your registered mobile number. Enter received OTP on the newly generated field on the same form at the bottom right corner. Now click on “e-Sign” button. Your document will be e-signed, and you will get a new PDF application form with e-Sign. Now you just need to click on “Submit” button to submit your application for e-KYC. That’s it! You have completed all the work for your eKYC. Now you will be able to start investing in mutual funds right away without going to any AMC. Generally, CVL KRA verifies the data on the same day, and you can get registered on the same day. 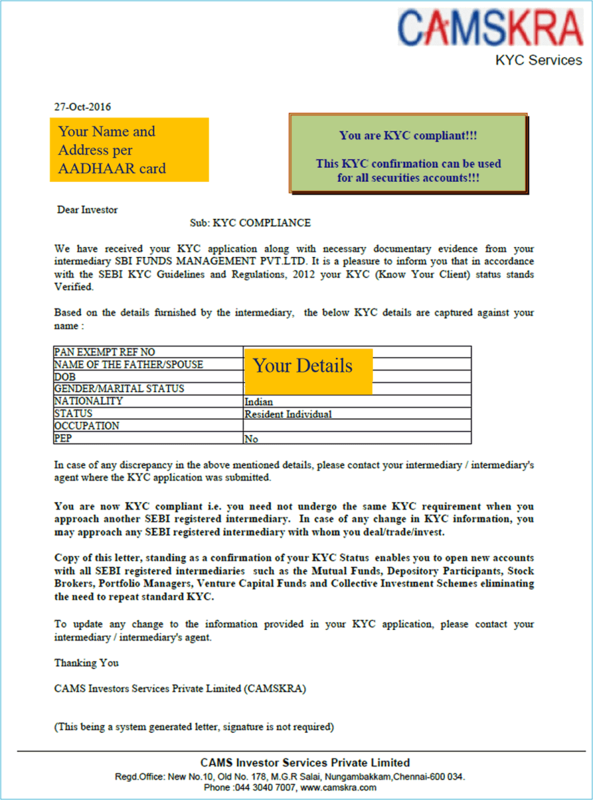 You will get an email from CAMSKRA with the subject line KYC Verified” with a PDF file attachment saying that now you are KYC Compliant! See below snap of the letter. There are many other AMC’s which provide this facility like LnT mutual funds, HDFC mutual funds, Birla Sun life Mutual funds, Reliance mutual funds, Quantum Mutual Funds, UTI Mutual Funds, etc. 1. Do I need to present the physical copy of the eKYC application or proof of Aadhaar card? No, this is an entirely paperless transaction, and everything will be done electronically. 2. 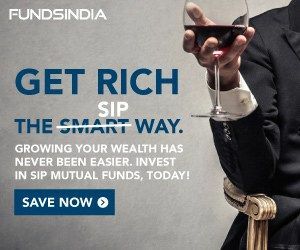 What do I need to do if I want to invest more than Rs 50,000/- per mutual fund house in a single year? Investors would need to introduce their signature in AMC records and also have identity verified by them during their visit to our branch. KYC completion using biometric verification allows investments without any upper limit. 3. Which address would be captured for my eKYC? The address registered as per the Aadhaar would be captured as the address for your KYC. 4. Can I change my Personal Details while applying for eKYC? No. First, you need to get that fixed from UIDAI and then apply for eKYC. 5. Where can I check my KYC Status? There are several ways from where you can check your KYC status. a. You can also visit the websites of any KRA and verify the status online. b. Investors may verify their PAN status by visiting CAMS KRA and entering their PAN in the ‘My KYC Status’ tab. 6. How will eKYC status be informed? Once your KYC is registered with any of the KRA, you will receive a letter/email confirming the same. 7. Do I need to attach a photocopy of the KYC letter with every investment I make? Once you are KYC registered, you need not submit any KYC documents to the intermediary. Still, you need to inform the PAN number and date of incorporation so that they can verify your KYC status in the KRA system. Providing the copy of the KYC letter will help the intermediary in processing your requests faster. Let me know how was your experience in getting your eKYC registered online. Do share this post with your friends on social media. 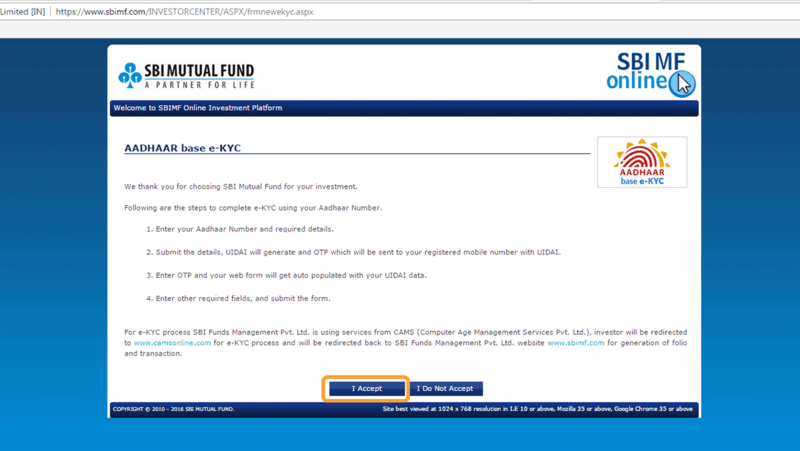 Disclaimer – All images are taken as a screenshot from my computer from SBI MF and CAMS online website. Awesome! When I had completed my KYC through AMC, they took more than 15 days to verify it. I just registered for my friend and ekyc with aadhaar card was done in just a day. Glad it helped your friend. Thanks for dropping by here..
i have done e kyc verification for one MF company for my first investment. so i need to go for another round e kyc/kyc for another Mutual Fund company.. please tell me. ekyc or kyc is a one time process. So you need not to go for another kyc at other AMC. I completed ekyc in the last week after reading your article. Is this the good time to invest in mutual funds now as sensex is low. Hey Pravin, Good to know that your eKYC is complete by referring my post. Obviously, this is the best time to invest in mutual funds. As the saying goes “invest in markets are down.” And frankly saying there is always the best time to invest in funds. Sensex has already corrected 10% in 2016 and is expected to perform well in 2017. So Invest now only to get good returns when Sensex goes up. can i use my PAN to do online ekyc? Hi, you need AADHAAR card to do eKYC. I completed my e-KYC process. Is the 50000 restriction applies per person or per fund house? Meaning will I be able to invest 30000 in different fund house company’s? As stated above in Limitations of eKYC section, you can can only invest up to Rs 50,000/- per Financial year, per mutual fund house. To your questions of 30000, yes you can invest 30k in various mutual fund houses per financial year. Thank you so much for the detailed guide. It’s absolutely the perfect one. I done my ekyc last week and i also got the letter that my kyc is done. Thank you for the excellent process explanation. Thanks Manish for the comment. Happy that my post helped you. ekyc is good but i want to invest more than rs. 50,000. So how can i do that. 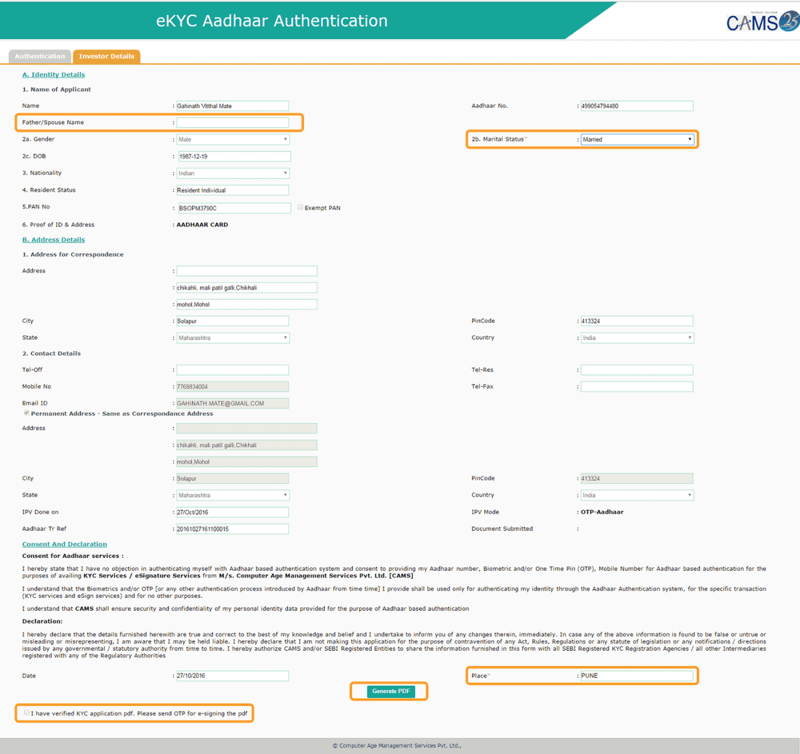 Download KYC form from any of the AMC’s website or from transfer agent’s website or, visit ‘Downloads’ section of� http://www.cvlindia.com/. Take a print out of the KYC application form for individual (for fresh KYC). Fill the form as instructed. You need to provide self-attested copies of the following documents and carry originals for in-person verification. Proof of identityProof of AddressPAN CardPhotographSubmit the duly filled and attested form to eitherAMC with which you wish to investRegistered Transfer Agent such as CAMS, Karvy, Franklin Templeton or Sundaram BNP Paribas Fund Services. Check websites of respective company for the address. There are no fees for KYC registration. Best guide on ekyc. Thanks a lot. Got ekyc in just 2 days only. Thanks Ranveer. Good to know that you are ekyc verified. Now start investing as soon as possible. Hello sir, i completed ekyc for sbi mutual fund then will that work for other funds also. Yes. As explained in post above, it’s onetime process. You can invest in any mutual fund house. Hey there, great work. It’s really fast to get ekyc now. I have completed my eKYC procedure. I got a message but i didnt get the letter or mail. and Now it is showing that my KYC is not verified and i am again tried with eKYC then it is showing that my eKYC procedure is completed and now you can invest. Need your help. Dont know what to do. When you completed the procedure? Sometimes it may take 3-4 days to get a letter but meanwhile you should be able to verified status on KRA site. Please check your status on https://www.cvlkra.com here go to KYC enquiry and enter PAN and Captcha code. Still if this is not resolved, please drop me an email with details and I would help you to complete this. When I checked my KYC status, its showing as “Contact details are not available(Missing Field Descriptions)” Is there anything I need to do? Hi Charlie. I am also facing the same issue. I see “Contact details are not available” and the processing is pending for over two days. Did you find any solutions for this? i have completed Ekyc but now i want to invest more than 50000. what should i do? i have done EKYC but now i want to invest more than 50000/-. what i should i do? Hi Vijay, you can approach any Mutual fund AMC and complete KYC procedure by submitting few documents. Then you can invest any amount you wish for. Hope this help! What is the procedure at that time?How to remove this limit of 50000 then? Also what things it will need,? Will it be big process. Hi Rahul, In such cases you just need to visit your Mutual fund office and just fill KYC form over there and you are good to go for unlimited investment. Long back i opened a demant account with ICICI. Whether on opening an demat account KYC is created? “Your PAN XXXXXXXXXXX is KRA-KYC complied. I see with NDML KRA KYC is registered. Hope this means my EKYC is done or KYC is done? if it is KYC , then due to demat account this KYC is created? Yes, your KYC is already completed. My ekyc status ‘ON HOLD-new kyc’ in cvlkra.com website ,reason shows name missmatch between aadhaar card and pan.Then how to complete my ekyc? Hello Safarulla, many people are facing this issues due to naming scheme on Aadhaar card. You can either get corrected your Aadhaar card with the same name or visit any mutual fund (in which you want to invest) office near by you, they will help you complete normal KYC.